Little, Brown and Company, 9780316337540, 432pp. The true story of two African-American brothers who were kidnapped and displayed as circus freaks, and whose mother endured a 28-year struggle to get them back. The year was 1899 and the place a sweltering tobacco farm in the Jim Crow South town of Truevine, Virginia. George and Willie Muse were two little boys born to a sharecropper family. One day a white man offered them a piece of candy, setting off events that would take them around the world and change their lives forever. Captured into the circus, the Muse brothers performed for royalty at Buckingham Palace and headlined over a dozen sold-out shows at New York's Madison Square Garden. They were global superstars in a pre-broadcast era. But the very root of their success was in the color of their skin and in the outrageous caricatures they were forced to assume: supposed cannibals, sheep-headed freaks, even "Ambassadors from Mars." Back home, their mother never accepted that they were "gone" and spent 28 years trying to get them back. Through hundreds of interviews and decades of research, Beth Macy expertly explores a central and difficult question: Where were the brothers better off? On the world stage as stars or in poverty at home? TRUEVINE is a compelling narrative rich in historical detail and rife with implications to race relations today. Beth Macy writes about outsiders and underdogs, and she is the author of the New York Times bestseller, Factory Man. Her work has appeared in national magazines and newspapers and The Roanoke Times, where her reporting has won more than a dozen national awards, including a Nieman Fellowship for Journalism at Harvard and the Lukas Prize from the Columbia School of Journalism. She lives in Roanoke, VA.
Named one of fall's most anticipated titles by Vulture, Entertainment Weekly, Kirkus, The Millions, Literary Hub and others! "If over a hundred years ago there had been Black Lives Matter, the mother of George and Willie Muse would have joined and marched for the safe return of her sons. Back then, almost a century ago, she could only keep learning and finding folk who agreed she had a right to her family...a right to the love and protection of her sons. 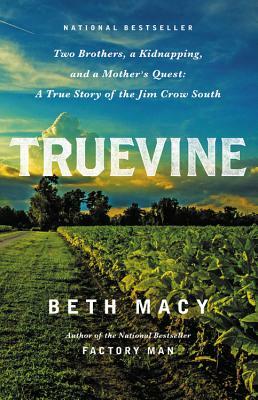 Beth Macy in Truevine has given us a stirring story of the persistence of faith...the strength of love...in this tale of a mother's journey to reclaim not only her sons but her right to them. "—Nikki Giovanni, poet and one of Oprah Winfrey's "Twenty-five Living Legends"
"One of my favorite works of nonfiction of 2016...Macy nails it. "—Vick Mickunas, WYSO "Book Nook"
"One of my favorite nonfiction books of the season...fascinating. "—Joan Grenier, WAMC's "The Roundtable"